Posted on November 30th, 2017 in Goat's Forecast. The surf forecasts are all TG’s original, ir-responsible, work. Hours of detailed analysis of lots of complicated stuff go into putting together the surf forecast. TG constantly strives for precision and perfection . The typing alone takes forever, using two fingers. See if you can find where that was cut and paste from. Any cut and paste bits are from the sources identified below…. How fascinating is that 1004 isobar below, tracking along the northern coastline, where the land meets the sea. Water temp is still bouncing around from day to day as the East Coast Current swirls down the coast and gets disturbed by days and days of Noreasters and the occasional short Southerly spell. So tomorrow, the next day or the next, might be 18 …or might be 22. You’ll just have to stick your big toe in the water to find out each day. Partly cloudy. Winds northeasterly 15 to 25 km/h. Partly cloudy. Slight (30%) chance of a shower in the afternoon. Winds northeasterly 15 to 20 km/h becoming light in the morning then becoming northeasterly 25 to 35 km/h in the middle of the day. Partly cloudy. High (80%) chance of rain, most likely in the late afternoon and evening. The chance of a thunderstorm in the afternoon and evening. Winds north to northeasterly 15 to 25 km/h increasing to 30 km/h before turning northwesterly 15 to 20 km/h in the late evening. Partly cloudy. Medium (40%) chance of showers, most likely in the evening. Winds north to northwesterly 15 to 25 km/h tending west to northwesterly during the day then becoming light during the evening. Partly cloudy. High (80%) chance of showers, most likely in the afternoon and evening. The chance of a thunderstorm in the afternoon and evening. Light winds becoming east to southeasterly 15 to 20 km/h during the afternoon then becoming light during the evening. Cloudy. Very high (95%) chance of showers. The chance of a thunderstorm. Light winds becoming south to southeasterly 15 to 20 km/h during the morning then tending east to southeasterly during the day. Partly cloudy. Medium (60%) chance of showers. The chance of a thunderstorm. Light winds. Posted on November 30th, 2017 in Dee Why. Impressive clouds over the city this morning but far from impressive conditions at Dee Why as we finished up November. Wind was faintly SSW early but should come around to the NE and reach 10 -15 kts as the day warms up. The MHL buoy is showing a metre of swell height at sea – unchanged since day before yesterday. The dominant period and direction have been bouncing around between coming from the east at about 8 seconds to coming from the south at around 12 sec. The advice is once again to go back to where you found waves yesterday. Tide hit a 1.5 m high at 0610 and is currently dropping to a 0.5m low at 1220. Should be a warm 27 today and given the clouds, it’s no surprise that the possibility of showers are in the forecast. 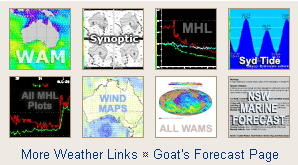 The Goat’s Thursday forecast should be along later today so I’ll be keen, as always, to see what he makes of the models. From my cursory look it would seem that there’s reason to be hopeful about next week’s surf outlook – particularly for the mornings at east magnets. Have a great Thursday everyone and go well! A slow-moving high pressure system near New Zealand extends a ridge towards northeast New South Wales, directing generally east to northeasterly winds along the coast. Winds will freshen gradually ahead of a significant southerly change on Sunday and Monday. Northeasterly about 10 knots increasing to 10 to 15 knots in the late afternoon. Winds reaching up to 20 knots offshore in the late evening. Below 1 metre, increasing to around 1 metre by early evening. Partly cloudy. 30% chance of a shower this morning. 1 to 1.5 metres, increasing to 1.5 to 2.5 metres around midday. East to northeasterly below 1 metre. Mostly sunny. 30% chance of a shower inshore in the afternoon. Near zero chance of rain elsewhere. Northeasterly around 1 metre inshore, increasing to 1 to 1.5 metres offshore during the morning. Partly cloudy. 70% chance of showers. The chance of a thunderstorm in the afternoon and evening. Posted on November 29th, 2017 in Dee Why. Light fog just burning off when at 0700 when I grabbed the pictures. It looks as though the energy levels might be ever so slightly higher than yesterday. The MHL data shows no real change in the height (1 m) or direction (E by ESE) from yesterday, but as of 0500 the period was nearly 13 seconds out at sea – which is up a fair amount from yesterday’s 8 or so seconds. I didn’t see either of the punters at the point score a wave, but looking at it, I’d guess they’re getting the odd barely catchable knee plus one along the rocks. So nothing to get excited about really, but there might be the occasional set. We’re heading to a high of 26 along the coast today and there’s a 60% chance of a light shower. Wind should be out of the east to SE but only around the 10 kt mark. Tide was high at 0520 and will be back to low at 1120 – when you might have the best chance of finding a wave. Tomorrow looks like being more or less similar to today but from Friday the NE wind should start to kick in pretty hard. That may push up some junky wind swell for the semi-protected north corners. Have a great Wednesday everybody and keep on smilin’! A slow-moving high pressure system near New Zealand extends a ridge towards northeast New South Wales, directing generally east to northeasterly winds along the coast. Winds will freshen towards the end of the week ahead of a more significant southerly change later on the weekend. East to southeasterly about 10 knots. Partly cloudy. 50% chance of showers this morning. Variable about 10 knots becoming northeasterly 15 to 20 knots in the early afternoon. Partly cloudy. 40% chance of showers. Northeasterly 15 to 25 knots increasing to 25 to 30 knots during the evening. Cloudy. 40% chance of showers. Posted on November 28th, 2017 in Dee Why. Just a faint offshore breeze at 0615 ensured a smooth surfaced ocean at Dee Why. Out at sea the MHL buoy was detecting a metre of 9-sec ESE bump, but from what I could see, it wasn’t translating into surf. No one seemed to be in the water and there was no obvious reason to think there should be. Tide was a 1.3 m high at 0430 and is now dropping to a 0.7m low at 1015. We’re going to a high of 26 with a 30% chance of a sprinkle or two in the afternoon. By then the wind is expected to be coming from the south, but only at around 10 kts. This morning’s swell modelling continues to project flat to near flat until Friday morning or so. But thereafter it seems we could see a period of stong NE wind and accompanying building NE wind swell. Then over the weekend the wind swings south and by Sunday there could be a mix of reasonable size NE and S wind swell. It then looks like maybe the wave energy will stick around and the wind starts to back off, particularly in the mornings of Monday ant Tuesday. Maybe. Possibly. We can hope! Have a great Tuesday and get up to some good where you can! A slow-moving high pressure system near New Zealand extends a ridge towards northeast New South Wales, directing east to northeasterly winds along the north coast, while a feeble trough has brought a weak southerly change to the southern half of the coast. Winds will turn east to northeasterly throughout by Wednesday as the trough dissipates and the ridge reasserts its dominance over southern waters. Northeasterly winds will freshen towards the end of the week ahead of a more significant southerly chance forecast for the weekend. East to northeasterly 10 to 15 knots, tending southerly about 10 knots during the morning and early afternoon. Partly cloudy. 60% chance of showers offshore, 30% chance elsewhere. The chance of a thunderstorm offshore. East to northeasterly about 10 knots. Partly cloudy. 50% chance of showers. Northeasterly 10 to 15 knots increasing to 15 to 25 knots during the morning. Below 1 metre, increasing to 1 to 2 metres during the afternoon. Posted on November 27th, 2017 in Dee Why. High overcast and 7-9 kts of NNE breeze made for a rather dull picture this morning when you correspondent climbed aloft to the crows nest for a scan of the surf situation. Swell settings are pretty much where they were yesterday (ie, a metre of 9-sec east bump at sea). So the short version is: if you found a little wave on the low tide yesterday, get back there soon because said low is at 0905 this morning. I reckon a waist high wave would be doing pretty well this morning, so take your tiny surf option if you’re going hunting. According to the Bureau despite all the high cloud, there’s only a slight chance of a shower today. It should get to 26 along the coast and wind should pick up to 10-15 kts as it swings to the NE by late morning. Outlook for the remainder of the week is for the current conditions to gradually decay toward midweek before turning around and gradually coming back up into the waist to chest range at east magnets by Friday-Saturday. On current reckoning next week is shaping to broadly similar to this, but possibly with a south pulse arriving on Monday – along with heaps of south wind. Onward friends, onward through the season of tininess! A slow-moving high pressure system near New Zealand with a ridge to the northwest is directing east to northeasterly winds along the New South Wales coast. Little change in the synoptic pattern is expected over the forecast period. Cloudy. 40% chance of showers offshore, near zero chance elsewhere. The chance of a thunderstorm offshore this evening. Northeasterly 10 to 15 knots turning easterly below 10 knots during the morning. 1 to 1.5 metres, decreasing to 1 metre during the morning. Easterly 1 to 1.5 metres, tending northeasterly 1 to 1.5 metres during the morning, then tending east to northeasterly around 1 metre during the afternoon. Cloudy. 80% chance of showers. The chance of a thunderstorm in the afternoon and early evening. Posted on November 26th, 2017 in Dee Why. Faint ENE breeze lightly texturing the surface as of 0730. Swell’s a smidgen bigger over yesterday and a touch more south at 103 degrees. Tide was closing in on the 0800 low when I grabbed the pics. It’ll be back to a 1.46 m high at 1415. By then the wind should be chugging along at 15-20 kts. At the same time the wind swell should bump up according to the Bureau. The latest run of the models seems to be pointing toward the slight increase of later today being sustained across the rest of the week. So, more hunting around for knee to occasionally waist high bumps on the low tide. For what it’s worth, the long rage models are currently projecting a change to more southerly conditions next weekend. But it’s likely to be accompanied by southerly wind. Have yourself a fine old Sunday everyone and keep on smilin’! Northeasterly about 10 knots increasing to 15 to 20 knots in the middle of the day. Around 1 metre, increasing to 1.5 metres by early evening. Easterly around 1 metre inshore, increasing to 1 to 1.5 metres offshore. Partly cloudy. 20% chance of a shower offshore this morning. Near zero chance of rain elsewhere. 1.5 to 2 metres, decreasing to 1.5 metres during the morning. Easterly around 1 metre, increasing to 1 to 1.5 metres during the morning. Cloudy. 60% chance of showers. The chance of a thunderstorm in the afternoon and evening. East to northeasterly 1 to 1.5 metres, decreasing to around 1 metre during the afternoon or evening. Cloudy. 70% chance of showers. The chance of a thunderstorm in the afternoon and evening. Posted on November 25th, 2017 in At large. Early was the plan this Saturday. Tide was low at 0700 so the tiny 0.9 m 8-sec east wind bump wasn’t getting swamped. Even so, it was pretty gutless and struggling to get much above the knee high mark. Wind was light from the NNE when I checked conditions at 0620. There weren’t many surf options around, so expect to be cheek by jowl anywhere that’s picking up the bump. We’re going to a high of 27 today and the wind will do the summery thing and pick up into the 15-20 kt range from the NE by this afternoon. Next tide is a 1.5 m high at 1320, so get in asap. Tomorrow’s shaping to be pretty similar to today and it appears that we’re going to be stuck in this marginal pattern for another week or so – if the models are to be believed. Have a top old Saturday everyone! A slow-moving high pressure system near New Zealand with a ridge to the northwest is directing east to northeasterly winds along the New South Wales coast. A little change in the synoptic pattern is expected over the forecast period. Northeasterly 10 to 15 knots, reaching up to 20 knots inshore in the late afternoon. Around 1 metre, increasing to 1 to 1.5 metres inshore during the afternoon. Northeasterly about 10 knots increasing to 15 to 20 knots in the morning. Around 1 metre, increasing to 1 to 1.5 metres offshore during the afternoon. East to northeasterly around 1 metre inshore, increasing to 1 to 1.5 metres offshore during the morning. Partly cloudy. 20% chance of a shower offshore in the early morning. Near zero chance of rain elsewhere. The chance of a thunderstorm offshore in the early morning. Cloudy. 60% chance of showers. The chance of a thunderstorm. Posted on November 24th, 2017 in Dee Why. Not a cloud in the sky when I climbed aloft to the RealSurf crow’s nest to check the surf for the first time today. As you can see from the snap below, we’re still going sideways with the wave situation. There were a few keen types in the water near Kiddies but waves looked to be knee high at best. It was too small for the point to be doing anything. As of 0700 North Head was seeing 3-4 kts of NNW breeze. The Bureau says it’ll swing around to the NE and come up to 10-15 kts later. Out at sea, the MHL buoy was seeing 0.8 m from the ENE in the pre-dawn hours. Unfortunately the period was a wind choppy 5 seconds. So, it’s super tiny and super gutless. A slow-moving high pressure system over the eastern Tasman Sea is maintaining a ridge to its northwest, directing mostly east to northeasterly winds along the New South Wales coast. This pattern is expected to persist over the weekend before a southerly change arrives on the south coast on Monday. North to northeasterly 10 to 15 knots. Northeasterly about 10 knots increasing to 15 to 20 knots during the day. Partly cloudy. 20% chance of a shower. Posted on November 23rd, 2017 in Goat's Forecast. Mother Nature has heard you all cry out: Onshore! again! day after day. But she’s misheard that as: Encore! again! The wind has drowned you out while she’s conducting her symphony of the elements. So could you please all speak more distinctly in future. In the meantime, she’s already programmed in a bit more of the same, thinking that’s what you want. With the onshores has come some marginal to tiny surf… But some pretty fabulous weather, and the water has warmed back up a little. It ain’t all that bad. If you’ve been able to jag a wave at the right tide, then stay alert and grab it when you can. Happy Thanksgiving to all our American friends, here or there, and to everyone who likes a good turkey! Heard of a worthy cause this morning … Saturday 5 k walk to raise money for research to cure brain cancer in young people. 8.30am registration at Shelley Beach Manly for pleasant walk to North Curl Curl. So the surf’s not perfect. There’s still an awful lot to be thankful for. Mostly clear. Slight (20%) chance of a shower in the outer west early this evening. Near zero chance of rain elsewhere. Winds northeasterly 15 to 20 km/h. Mostly sunny. Slight (30%) chance of a shower in the west in the afternoon and early evening. Near zero chance of rain elsewhere. Winds north to northeasterly 15 to 20 km/h becoming light before dawn then becoming east to northeasterly 15 to 20 km/h in the middle of the day. Mostly sunny. Light winds becoming east to northeasterly 15 to 20 km/h in the middle of the day then becoming light in the evening. Partly cloudy. Slight (30%) chance of a shower or thunderstorm in the west in the afternoon. Light winds becoming northeasterly 15 to 20 km/h during the day. Cloudy. Medium (60%) chance of showers. The chance of a thunderstorm in the afternoon and evening. Light winds. Cloudy. High (80%) chance of showers. The chance of a thunderstorm later in the day. Light winds becoming easterly 15 to 20 km/h during the day. Cloudy. High (80%) chance of showers. The chance of a thunderstorm later in the day. Light winds. Partly cloudy. Medium (60%) chance of showers. The chance of a thunderstorm later in the day. Light winds becoming northeasterly 15 to 20 km/h during the day. Posted on November 23rd, 2017 in Dee Why. Beautiful sunny morning with light WSW breezes but the little east wind bump of the last few days has slipped down another cog. The MHL buoy’s most recent report showed 0.8 m of 7-sec east and as you can see from the pictures, the results where Dee Why is concerned are not impressive. It’s weak, inconsistent and struggling to make the knee high mark. And given the settings, I’d be surprised if it was substantially bigger elsewhere. To the extent it matters tide was low at 0525 and will be back to a 1.6 m high at 1155. We’re headed to a high of 25 today and the Bureau says there’s a 30% chance of a possible shower later. The NE wind should kick in for this afternoon, but only be into the 10-15 kt range. Have yourself a terrific Thursday everyone and stay happy! A slow-moving high pressure system over the eastern Tasman Sea is maintaining a ridge to the northwest, directing mostly east to northeasterly winds along the New South Wales coast. Very little change is expected in the pattern during the next few days. Partly cloudy. 20% chance of a shower during the morning and afternoon.